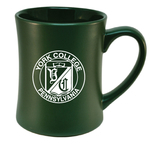 16oz ceramic mug with a green debossed York College of Pennsylvania seal logo. 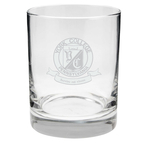 2oz glass shot glass featuring a repeating YC with a YC Spartan logo in the center. 26oz Sports water bottle with a push and pull lid. RFSJ 20 ounce travel mug featuring York College Alumni on the front. RFSJ 20 ounce travel mug with York College Dad imprinted on the front. 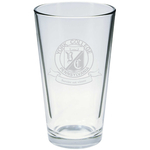 16oz Mug with an etched imprint of the York College of Pennsylvania seal and matte finished surface. 22oz large bowl mug with matte finish and York College of Pennsylvania white imprint. RFSJ 20 ounce travel mug with York College mom imprinted on the front. 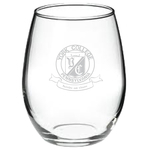 16oz stainless steel travel tumbler with York College of Pennsylvania pewter emblem. Tumbler has pull off lid with slide closure at lip. Stemless glass wineglass with etched YC and swirl design. 16oz vintage design mug with screen imprint of 1787 York College of Pennsylvania on a matte surface. 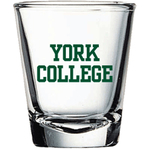 Standard 1.5oz shot glass with green screen imprint of York College on the front. RFSJ 16oz York College Dad mug features the York College of Pennsylvania corporate. RFSJ 16oz York College Grandpa Mug features the Grandpa above the York College of Pennsylvania corporate logo. Holds 20 oz. of liquid. Holds 10.5 ounces of delectable wines or drinks.